Monday brings an opportunity to practice flower arranging by joining in Cathy’s weekly challenge In A Vase On Monday to create a floral arrangement from materials gathered in one’s own garden. The Camellia sasanqua ‘Yuletide’ is blooming as it should be at this holiday season and though it has appeared in many recent Monday vase, it takes center stage again this week. But the original inspiration for this arrangement was a group of 6 small Penstemon digitalis ‘Husker Red’ plants I pulled from the meditation circle today where they had sprouted up. I thought the red and green hues of the leaves would make a nice arrangement in and of themselves. I used the plants, roots and all, placing them over top of florist’s foam, secured with pins. Later I will try to reestablish them in one of the borders if they hold up. Eventually I could not resist adding the camellia flowers for a bit more color, but using them led the design away from the restraint I had envisioned. I thought I would create a low, arrangement, but raise it by using a crystal pedestal dish. The design works best from overhead though as I did not work out the proportions carefully except from the top view. A few sprigs of black berries of Liriope spicata (creeping lilyturf) added a textural element to contrast with the rest of the design. The dark color of the berries are intended to pick up the deep coloring in the penstemon as well. One small sprig of Achillea filipendulina (Fern-leaf Yarrow) was blooming yesterday and it made a useful accent. The arrangement will add some color and cheer this week as Christmas nears. Saturday we had a snow that lasted about 30 minutes before turning to rain. The snow did not stick at all but it was fun to watch. And yesterday was winter solstice—the days are getting longer. Thanks to Cathy at Rambling In The Garden for hosting. Please visit her to see what she and others are placing In A Vase On Monday. This entry was posted in garden and tagged Camellia sasanqua 'Yuletide', dutch lavender, flower arranging, flower design, garden photography, in a vase on monday, nature photography, Penstemon digitalis 'Husker Red' (Beardtongue) on December 22, 2014 by pbmgarden. Lovely holiday arrangement, and I’m in awe that you found parts of it in your garden. A brown blade of grass under snow would be all that I could find. 🙂 Happy holidays. Thanks Judy, I was surprised to find the camellia flowers in good enough condition to use this week. We’ve had some cold nights. Happy holidays to you too! Donna I appreciate your lovely comments. With more time I might have tweaked it a bit more, but am happy with it. Hope you have a wonderful holiday. Very nice, Susie. I had four large ‘Yuletide’ camellias in my Chapel Hill garden, and I miss them. Thanks John. That is some lucky homeowner who inherited your garden. Hi Cathy, the liriope spicata spreads by runners and is hard to get rid of. Liriope muscari grows to form a nice clump, so I would recommend that kind. The camellias last only 3-4 days, but if the weather holds I can keep replacing them. As to tweaking, I should have kept turning the arrangement around as I worked on it to make sure it was balanced from every directions. Instead I worked mostly from above and when I lifted it onto the pedestal it didn’t seem balanced. You always do a wonderful job with your arrangements, Susie. and this one is no exception. I particularly like the addition of the lavender, which cools down the red of the Camellias. Best wishes for a happy holiday! Thanks so much Kris. I like that silvery color of lavender and the smell is so nice too. It’s very useful in arrangements. Happy holidays to you also. What a valuable plant the Camellia is Susie. I have to admit I am thinking of getting one for a pot on the terrace after seeing how lovely yours are. I like how you have used the unexpected foliage of the Penstemon to make a more sophisticated arrangement. I’ve been seeing some beautiful camellias this autumn. They come in a lot of different colors and habits. You’d probably enjoy having one on your terrace, particularly if you choose one that has good fragrance. I noticed the Penstemon foliage while checking the garden for GBFD and on a whim decided to use it. I think a different design somehow, without the competition of the red/yellow camellias would show off the penstemon to better advantage–maybe I’ll try it again sometime. How lovely! Your Camellias are so pretty and festive, and I do like that quirky little sprig of Achillea! The foliage is a very nice contrast – great idea to try and replant the Penstemon too. Thanks Cathy. I’m afraid everyone will be tired of seeing this particular camellia, but thought I’d better take advantage of it while it’s still blooming. Until the hellebores open there’s little else going on. That pink yarrow is quirky, you’re right. Don’t know why it continues to have one bloom every couple of weeks, but I’m glad! Happy Christmas! Very pretty, Susie, I so enjoyed your vases every week. Merry xmas and plenty of inspiration in 2015! Annette, thanks so much. I’ve enjoyed seeing your wonderful green spaces this year. Merry Christmas! 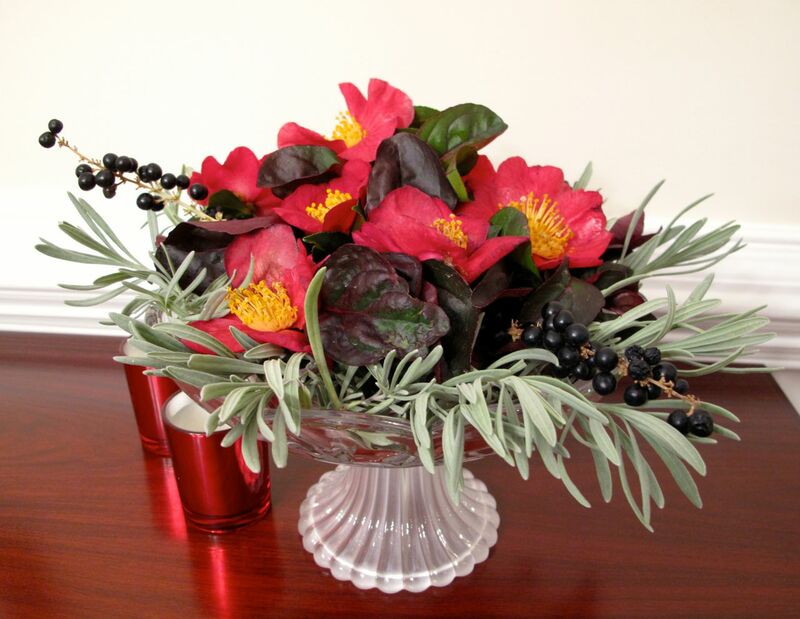 ‘Yuletide’ is perfect for a Christmas bouquet. I like the addition of the beardtongue leaves. They are beautiful. Thanks! It is nice that Husker Red seeds easily and produces volunteers. Don’t think I’ve ever used its foliage indoors before but will keep it in mind. 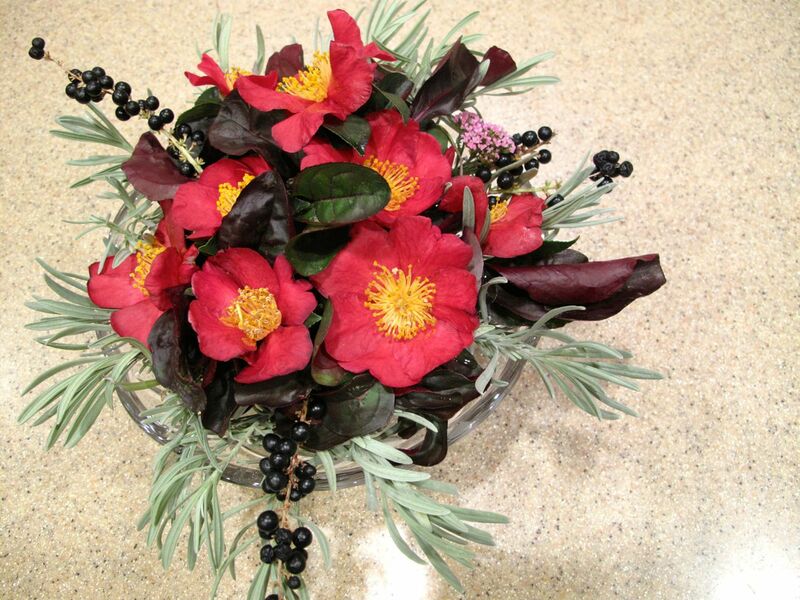 I love the red and black, a very sophisticated colour scheme and the Camellia is just perfect for a Xmas arrangement. I think I really must buy this gorgeous Camellia. Thanks Liz. I like that you thought the arrangement sophisticated—I almost used that term but was unsure. The black does add an intriguing element that might be fun to experiment with in the future. You might enjoy this Yuletide camellia. I’ve been wanting a white one. Merry Christmas to you! 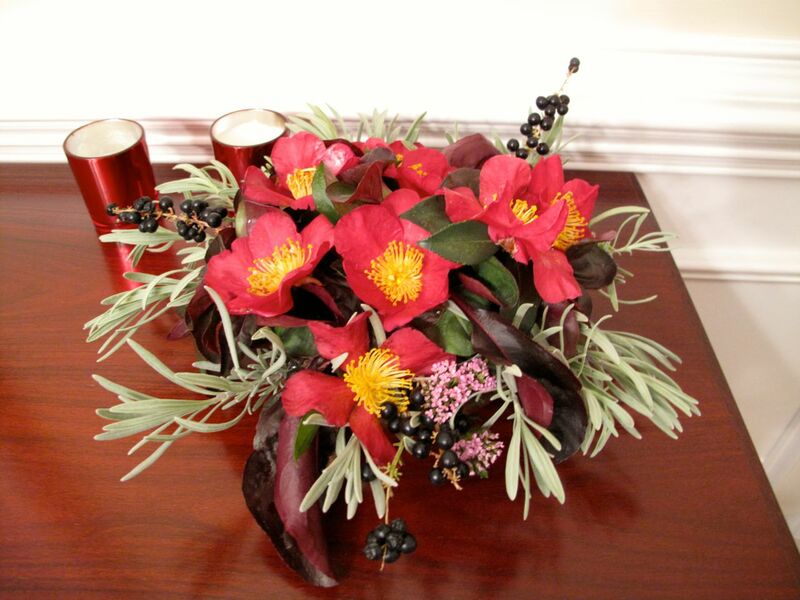 Gorgeous arrangement, I love the rich complexity and wonderful contrasting colors. Thanks, very kind of you Charlie.